When you’re gearing up for an exciting trip, the temptation’s always there to march out and grab the first camping bag you see – but hold your horses, because we’ve already done the legwork with our shortlist of the best day sacks out there. Not sure a day sack is exactly what you’re after? With capacities falling somewhere between 10 and 35 litres, days sacks are ideal for day hikes and commuting, and can easily handle a weekend’s worth of clothes, but it’ll be a struggle to squeeze in a tent or sleeping bag. For maximum wiggle room, take a look at our biggest offering and first choice bag, the Mountain Hardwear Scrambler RT. They all might look much of a muchness, but some daypacks are more adept at helping out in certain situations than others. Spending the day in a kayak? Look to the Aquapac 25-litre backpack for proper waterproofing, or go for something with an included rain cover. Going for a climb? A daysack with special storage features and loops, like the Osprey Talon 22-litre, is best for keeping all your gear within easy reach. We’ve made a note of what each bag is best at, and a few of its standout features, for quick and easy reference. While potentially pushing the limits of what could be considered a day sack, this 35-litre backpack from Mountain Hardwear is a godsend for those of us incapable of packing light (guilty). It trades in lots of smaller pockets for a few good-sized ones, great for stowing light macs, maps, and other essentials, and reviewers loved how light it was for the size, not to mention its durable 400 denier nylon construction. For its status as certified fantastic all-rounder, it takes our top spot for best day sack. Also available in bloke-specific dimensions, this women’s hiking bag fits exactly where it should thanks to a tailored harness and hipbelt, and twinned with adjustable suspension, that should all make for a thoroughly comfortable carry. The hip belt pocket keeps the essentials within easy reach, and does double duty as a pole-holder if need be (there’s also a delightfully-named ‘shove-it pocket’), but it’s not just about the peripheral bits. The big feature is its breathable back panel for wicking away moisture, making it a great bet for hot-weather hikes. With most daysacks being water-resistant rather than fully waterproof, this is a rare beast indeed, perfect for fishing, kayaking and other watersports. And when we say “fully waterproof”, we mean officially “protected against powerful water jets” waterproof – with its inner dry/wet bag and roll-down seal, you can be assured that stowed phones and cameras are well protected. It also makes our list for its superior transportability: compact and light whether wet or dry, it’s easy to throw in the hold and even floats should you find yourself upended. 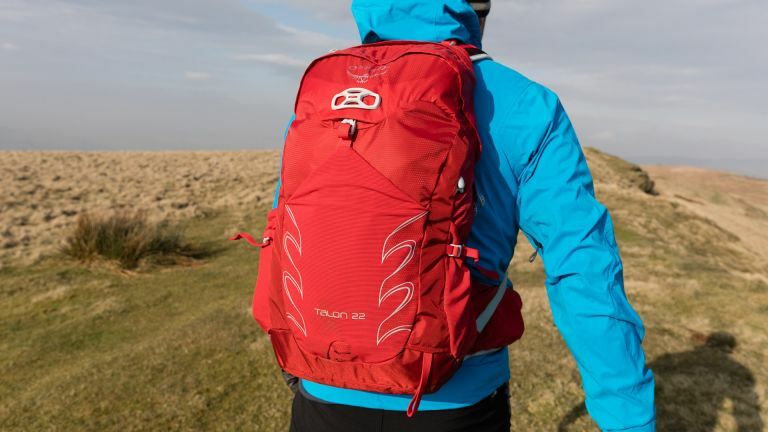 Second only to the Aquapac, the Osprey Talon 22 is our lightest backpack, with its trade-off between durable material and weight being the best on our list. As such, we think it’s ideal for day excursions both home and away when you’re not sure what the day’ll throw at you. There are attachments for trekking poles, bike helmets and ice picks; hipbelt pockets for snacks and phones; a large stretchy PowerMesh pocket for holding extra layers when the sun comes out, and quick-access sleeve for your hydration pack. Simply put, it might be on the small side, but it’s tops for versatility. This backpack might seem a little pricey on first glance, but as the name suggests, it’s all about the protection – and you can’t put a price on that. Intended for use on long bike rides and trails, it’s laden with features specially engineered for cyclists, like a backlight clip, XC/DH helmet carry, and a tool compartment that’s just right for stowing those allen keys and puncture repair kits. Most importantly though, it professes to be best for healthy backs. A winning mix of material stability, flexibility and shock absorbency, the Liteshield Back Protector shields your most important bits of bone should you suffer a fall. The last thing you want when you’re running is to be slowed down: enter our smallest daysack, coming in at just 15 litres. But despite its small size, it’s packed with clever features. The removable back padding is especially smart, useful for staying comfortable on marathon training sessions, or you can leave it off to shed unnecessary weight on shorter jogs. You can even buy extra pouches to create more storage space, although the belt and top zipped pockets are ample for valuables, and the hydration bladder compartment can hold a system up to 3L.